With a unique approach and dynamic, they perform Klezmer, Turkish, Russian, Greek, and Romanian Music and they weave a sound that, so like Music from these countries themselves, moves the listener physically, emotionally and spiritually. Merlin is one of the world’s leading players of traditional East European Klezmer Clarinet style, and apart from his own ensembles he has recorded and played with Boban Marcovic, Fanfara Ciocarlia, Fanfara Savale, Selim Sesler, Budowitz, Frank London’s Klezmer Brass Allstars and numerous others. Polina was born in Siberia and grew up in a Russian Jewish home where songs were regularly sung at table. Growing up in Tatarstan placed her close to Islamic ornamentation and timbre which can be heard in her unique vocal style and four octave range. 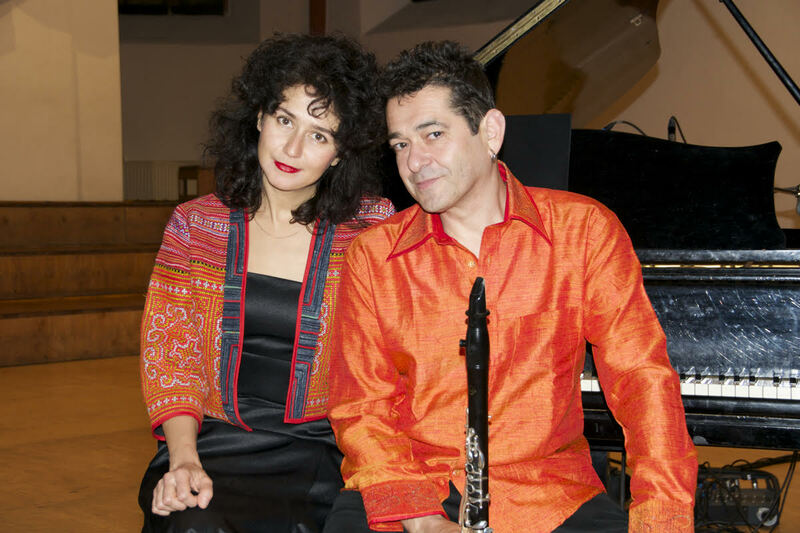 Touring with Simkha, the first Klezmer band since Perestroika she sang in dark Soviet theatres, to Boris Yeltsin and to the World. Shepherd’s compositions are highly original and sensitive… Yiddish or Slavic–style melodies ebb and flow. And here and there we hear a classical vocal style, something more operatic, or a flourish of a music theatre. Instrumental styles are just as varied: musical modes weave together with a klezmer-sounding clarinet, jazz–style saxophone and …rock guitar.